I have been pretty busy lately and Stitches West is to blame. First, I have a project that has been toiling in obscurity for years… My Central Park Hoodie. I haven’t mentioned it here in over a year, and the pattern, project, and yarn all relocated to different unknown locations. I wrangled everything together and started working on it in the evenings, with the hope of wearing it to Stitches West, a mere 2 years after I bought the yarn there. I am one and a half button bands (and some blocking) away from completion. The next time you see it, I will be wearing it at Stitches. Thanks to Jamie at Urban Fauna Studio (booth #1036) and Krista from Pigeonroof Studios (booth #637), I am not just a Stitches West shopper, I am a seller! UFS has both my stitch markers and fiber, and Pigeonroof will have my stitch markers. Yay! I am really excited about this and plan to break some rules and snap some camera phone pics of my items on display. I am headed to stitches tomorrow and Saturday and will be helping out in the aforementioned booths so say hi if you see me. Also I will be doing a Hazel Rose loom demo on Saturday at 1 pm in the Demo area so come by if you want to see a little loom in action. I plan to tweet my adventures, so follow me for pics and updates. 4 Responses to "A fiber filled weekend awaits"
Congrats! I probably saw you today. I hope it all went well. I love Target’s adult juice boxes. Best idea ever! I just wish more places did that. Yo! 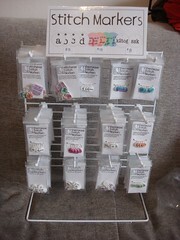 I bought one of each kind of the stitch markers you make! 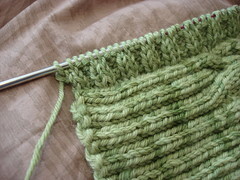 I don’t even know what kitchener stitch is, but I’m sure I will soon and I will use them. My favorite is the knit and purl, cuz I forget!